Five Star Didimala Lodge Is The World’s Largest Strawbale Building! Didimala Lodge's owners made only two requests: make our building audacious, and make it green. Edwin Anderssen from Dumani Architects won the bid. Situated 30 miles north of South Africa's capital, the five star lodge was built from 10,000 wheat straw bales. Wheat straw is an ideal building material since it is cellulose-based, meaning there is nothing for the critters to eat, and it is essentially a byproduct that might otherwise have gone to waste. To date, such luminaries as Nelson Mandela and Tony Blair have experienced the luxurious side of sustainable architecture here. Let's hope many more will do the same. The wheat straw bales were wrapped in chicken wire (a kind of light metal fencing ubiquitous in South Africa) and then covered in a layer of gunite. While an expensive and not-so-earth-friendly material, gunite nonetheless ensures the building will last a long time. The floors were made with polished screed and inlaid with pebble borders. The entire facility, which includes a 20 room lodge, a massive boardroom that seats 30, a function hall, and even an underground, soundproof cinema with 50 rotating seats, is built from the strawbale. Note the interior seating and shelving, all moulded into a soft, wavy form that is typical of versatile building materials. The roof was constructed with post-beam thatch. 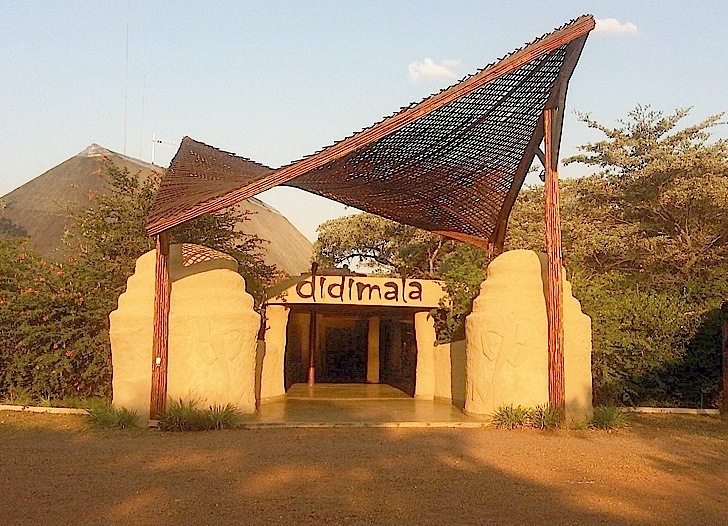 Didimala’s genius in a country like South Africa – still somewhat behind on the eco-scene – is to make a building genre typically reserved for “treehuggers” highly sought after by the upper classes. What a nice capture! Straw bale building is completed wrapped from lovely foliage that acts as a safety barrier. This metal fencing not only gives security but also enhance the beauty of the structure. I also work with California Fence Company that provides fabulous fencing options along with amazing fencing services for its clients that suit every budget. Thanks for nice sharing. I visited your link and was inspired to see the gorgeous fence that brings an elegant touch to this house. I liked your topic that you have shared. It is quite innovative and exclusive fencing style. I work with fencing company in and around California and provide amazing fence materials for both commercial and residential areas. Nice share. The roofs were constructed from post-beam thatch. 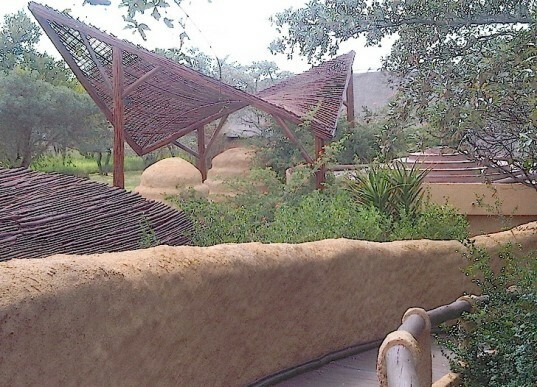 This is Africa's very first registered strawbale building! Every single building on site is made from straw bale. Because wheat straw is cellulose based, the critters aren't interested in it. Notice all of the interior seating and shelving was carefully formed out of strawbale. We especially love the outdoor shower! Nelson Mandela and Tony Blair are among the guests who have already stayed at this beautiful lodge north of Pretoria, South Africa. The floors were made from polished screed and inlaid with pebble borders.